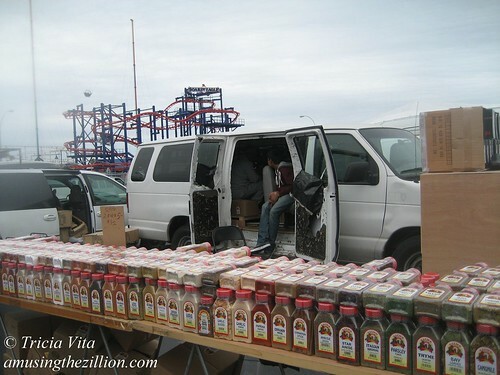 The BK Festival featuring displaced Aqueduct flea market vendors opened for the first time on Saturday in Coney Island. The new flea market is located on Thor Equities Stillwell property adjacent to Scream Zone and Nathan’s, site of Thor’s Flea by the Sea in 2009. Check out our flickr slide show. We took pix of everything that was there, to be fair and square. Unfortunately the opening day event was dismal. It was not in any way “like a state fair,” as hyped by the BK Festival management in advertisements, nor did it feature “upscale product,” as hyped by the New York Times in a puff piece on Joe Sitt. Not surprised. Just sayin’. 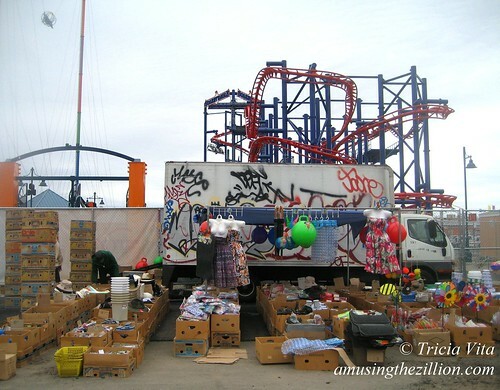 Like Thor’s “Festival by the Sea,” the new flea market bills itself as a festival because a flea market is not a permitted use on this property in Coney Island. In response to ATZ’s query last month about the zoning, Purnima Kapur, Brooklyn City Planning Director, wrote in an email: “The C7 zoning district in Coney Island does not permit Flea Markets as a permitted use; however small scale retail and restaurants are permitted in addition to amusements.” There are Use Groups A, B and C, with A being for Amusements, and a formula for their allocation. As we’ve said before, it’s a little tricky to figure out how “OVER 100,000 SQUARE FEET OF SHOPPERS DELIGHT!” is permitted when Sitt failed to win 10,000 square foot retail and the City’s own zoning says “Use Group C [Retail] uses shall be limited to 2,500 square feet of floor area and 30 feet of street frontage, except that on corner lots one street frontage may extend up to 100 feet.” Of course the city has long failed to enforce its own zoning. The furniture stores on the north side of Surf have continued to exist for years in defiance of the amusement zoning. 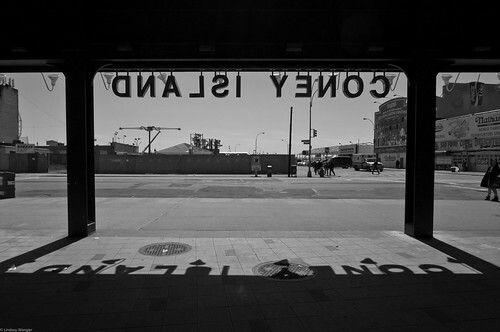 The only example of a flea market in Coney Island being closed that we’re aware of is when Mayor Giuliani shut down the flea on the north side of Surf prior to the opening of his new ballpark in 2000. Saturday’s rainy forecast kept some of the Aqueduct vendors away, yet the locations were said to be completely booked for the season. Assigned numbers were painted on the blacktop. 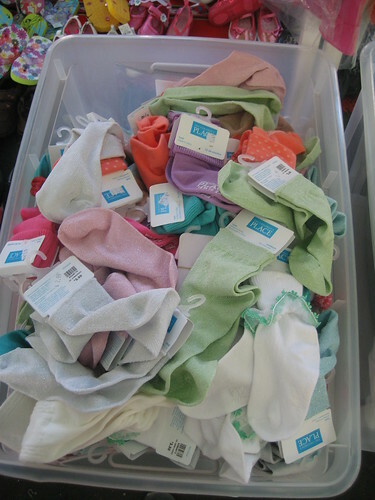 It was depressing to see miscellaneous items arrayed in rows of cardboard boxes–tape measures, sharpies, notebooks, cleaning brushes, sandals, toys, balls, what have you. 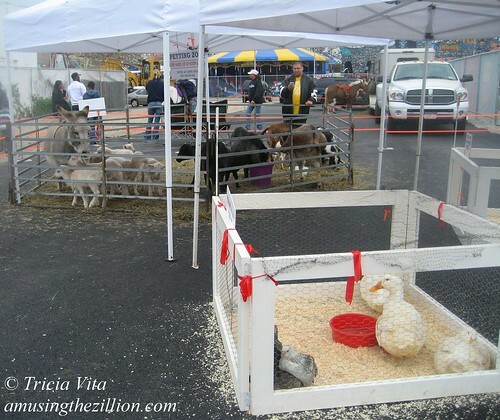 It was a typical market, with signs advertising prices starting at $1. Or 3 for $5. Booths selling household cleaning products, personal care products, tools, automotive accessories and cooking spices looked incongruous in the amusement area. It felt jarring to see the new Soarin’ Eagle roller coaster against a backdrop of signage advertising “Dresses For Less.” There were just a few vendors with what might be called “upscale product” displayed to advantage–snazzy belt buckles, some lovely clothing near the front of the flea market, and a booth with strollers, skateboards and kids toys. We found one item that we liked and purchased it for $10. The majority of space is taken up by flea market vendors, so it’s reasonable to say this event is indeed a flea market and not “like a state fair.’ The amusements consisted of a pony ride, a very small petting zoo, one inflatable bounce for kids (a second one was deflated), and two mimes. The Coney Island Dancers, who had brought in their sound system and were playing music, said they had been hired by the BK Festival. A few people were dancing on the sidewalk. 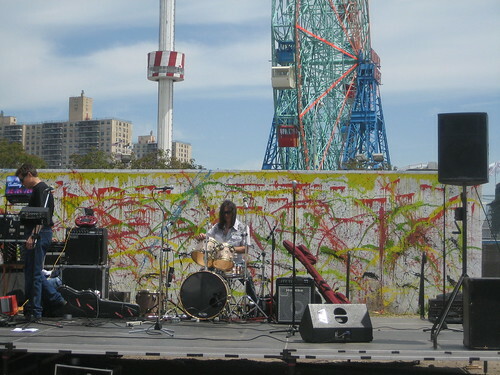 According to the Coney Island Rumor Mill, the BK Festival’s contract with Thor precludes them from bringing in mechanical amusement rides. It wouldn’t surprise me at all, considering that Sitt first evicted Norman Kaufman’s amusements from the property in 2006 and has failed to lease to several different carnivals and amusement operators who have tried to negotiate deals. As we wrote in Thor Equities Touts Coney Island as “RETAIL RIDE of a LIFETIME” (ATZ, May 4), we believe that the flea market or “shopping experience” is part of a strategy to win a variance for 10,000 square foot retail from the City’s Board of Standards and Appeals in a future administration. Having rides wouldn’t help that plan at all. 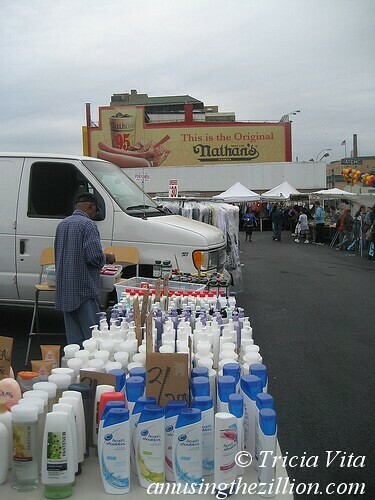 Like it or not, and some Coney Island businesses don’t like it at all, “NYC LARGEST FLEA MARKET WITH A FESTIVAL STYLE! [sic]” is on the verge of getting permits to open Aqueduct’s answer to Thor’s flopped Flea by the Sea in Coney. ATZ learned that Will McCarthy, the event organizer of the “BK Festival,” who already applied for a Temporary Place of Assembly Permit from the DOB, will meet with City officials on Thursday in hopes of speeding along necessary approvals from the FDNY and DEP. Sources say a meeting with the Brooklyn Borough President to discuss the festival’s plans is also on this week’s schedule. We were about to post this news when an article by Liz Robbins in today’s NY Times caught our eye: “With Its Move to Coney Island, Flea Market Is Sprucing Up.” The news that the festival management is set to sign a lease with Joe Sitt and is adding “some lace and frills to dress up” the flea concept is no surprise. What’s surprising is that the NY Times has done a puff piece on Joe Sitt’s adventures in Coney Island. As for the Flea, the reporter takes Sitt’s word for it that his Flea by the Sea model was successful. “Two years ago, when the Aqueduct gaming project seemed imminent, [Sitt] recruited vendors, from pickle makers to bakers, alongside entertainers for a monthlong stint in Coney Island. The results convinced him the model would work.” What entertainers? The only entertainers that we observed were local bands onstage and a clown making balloon animals for kids. In fact the flea was widely considered a flop. For starters, look at our flickr set or comments from the disillusioned baker in Lifestyler Magazine. Now back to our regularly scheduled post. The proposed locations for the flea’s “OVER 100,000 SQUARE FEET OF SHOPPERS DELIGHT!” are Thor Equities lots on both sides of Stillwell, where the disused tent frames from the 2009 flea remain. Thor’s lot on West 15th Street would also be activated. 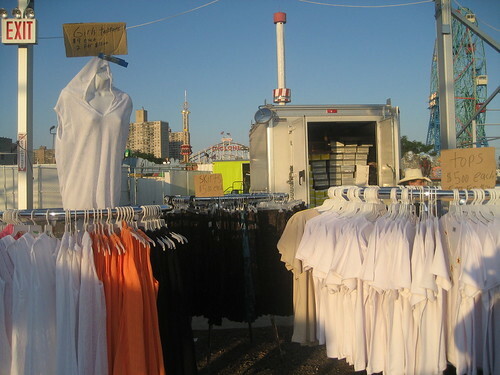 Although Coney Island’s C-7 amusement zoning (more on that later) does not specifically allow flea market use, it does allow temporary use for a fair. 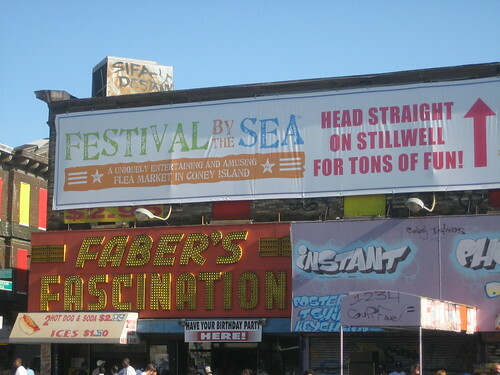 Thor’s Festival by the Sea aka Flea by the Sea in 2009 had such a permit. The BK Festival website was taken offline last week after all the media hoopla about the flea market. It promised “All Day Entertainment, International Food Court and Kidz Zone, Pony Ride, and Rides.” ATZ left a voice mail message for the management asking for more info about the rides. We haven’t heard back yet. UPDATE…10:20 am. We received an email from Will McCarthy, Event Director of BK Festival: “I wanted to reach out to you, as I know you have many concerns about our proposed project. I wanted to arrange a time when we can meet & discuss in detail all the wonderful family attractions we plan to bring to Coney Island this season. For the record BK Festival which will function like a state fair, comes to the new Coney Island with an array of colorful family experiences some of which includes – Monthly culturally themed activities, Interactive Sponsored Activities, Free Give Aways, Equestrian Center with pony rides & petting zoos, Live Entertainment (Concerts, Car Shows, Rodeos) International Food Court and our Outdoor Shopping Experience.” ATZ looks forward to bringing you a Q & A with the BK Festival Director in the coming days! 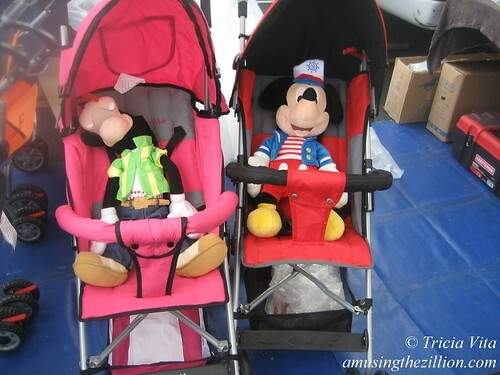 Are there any amusement parks in America that boast a flea market? A web search turned up a handful of defunct parks, including Williams Grove in Mechanicsburg, PA, which now host flea markets. A Yelper wrote: “Last time I was there I overhead a little boy whose comment to his dad really summed up the place best. 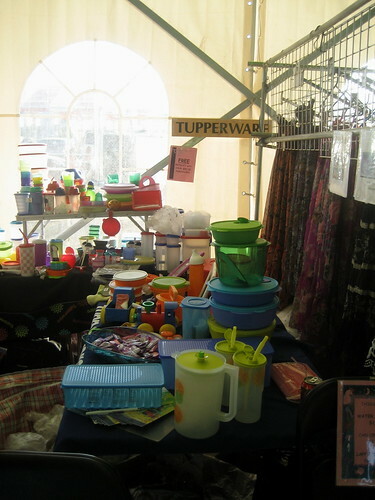 ‘They closed down the park and turned it into a yard sale. '” On the other end of the spectrum, there’s Colorado’s Mile High Marketplace, a huge flea, farmers and antiques market with a few amusement rides. 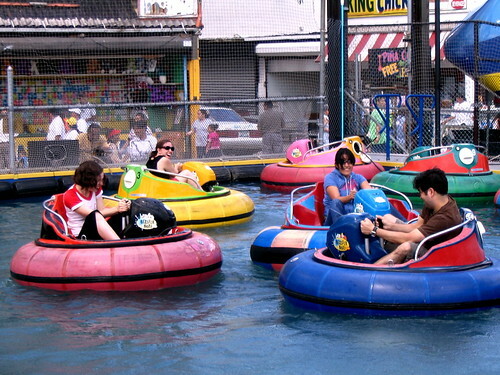 Coney Island, the birthplace of the amusement industry, is in a class by itself. Yet it’s become the guinea pig for Joe Sitt’s retail-by-the-sea aspirations. Over the weekend, ATZ talked to a few Coney business operators to find out their opinion of the market. Ride and game operators said that it’s better than having empty lots. They preferred to have amusements, which would stay open late and draw crowds rather than a flea market that will be dark at night. In Coney Island, the crowd comes late and stays late, often till 2 am. But amusement operators seemed resigned to the fact that Thor wasn’t about to bring in a carnival again. In the years leading up to the rezoning, Sitt brought in Reithoffer Shows, Geren Rides and other temporary amusements. At Thor’s Flea by the Sea, stands selling clothing and shoes were a reminder that in April 2009 Sitt’s pitch book unsuccessfullly used to lobby BP Markowitz for 10,000 square feet retail touted flagship retailers such as Abercrombie & Fitch, Gap/Banana Republic, and DSW (“Thousands of shoes…prices you love”). Was the flea market part of a strategy to win a variance from a future administration for 10,000 square foot retail? And this brings us back to Coney Island’s C-7 Zoning. We’ve appended the complete list of Use Groups A, B, and C below since most people snooze at the thought of looking at a zoning document. “A1” is for Amusements and is of course our fave. Use Group C is Retail. It’s a little tricky to figure out how “OVER 100,000 SQUARE FEET OF SHOPPERS DELIGHT!” is permitted when Sitt failed to win 10,000 square foot retail and “Use Group C uses shall be limited to 2,500 square feet of floor area and 30 feet of street frontage, except that on corner lots one street frontage may extend up to 100 feet.” Oh, but this is a Temporary Fair. And how many years will that be? Until Joe Sitt develops the property or sells it. “At least 15 percent of the Stillwell Avenue and West 10th Street street frontage of any zoning lot shall be occupied by Use Group A1 uses at the ground floor level. seats; Billiard parlors or pool halls, table tennis halls or bowling alleys, with no limitation on number of bowling lanes per establishment; Gymnasiums or recreational sports facilities, including but not limited to indoor golf driving ranges, batting cages, basketball, volleyball, squash and other courts, without membership requirements; Skateboard parks, roller or ice skating rinks;Theaters, including movie theaters, provided such use does not occupy the ground floor level of a building, except for lobbies limited to a maximum street frontage of 30 feet, except that on corner lot one street frontage may extend up to 100 feet. In the words of T.S. 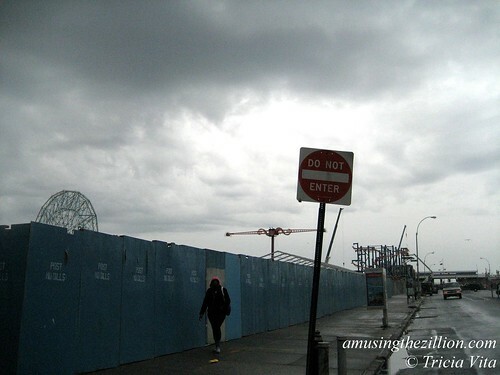 Eliot: “April is the cruellest month…” Last April, Joe Sitt of Thor Equities announced plans to demolish the buildings he owned along Surf Avenue in Coney Island. Now when visitors step out of Stillwell Terminal, their first glimpse of Coney Island will be the blue construction fence surrounding Joe Sitt’s Wasteland–the newest empty lot in the real-estate speculator’s collection of empty lots. The temporary one-story building that Sitt filed a variety of plans to build beginning in October has yet to break ground because the DOB “DISAPPROVED” the plans as many as 16 times over the past six months. Surf and Stillwell was the site of the now-demolished, century-old Henderson Music Hall. The Henderson had survived being cut in half in the 1920s to make way for the widening of Stillwell Avenue. 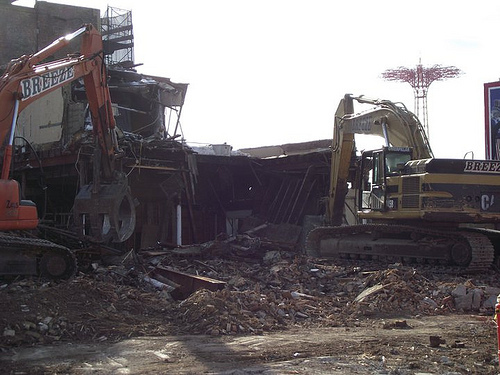 When the City rezoned the parcel for a high-rise “hotel” in July 2009, the historic building was doomed, even though no hotel is scheduled to be built there anytime soon. 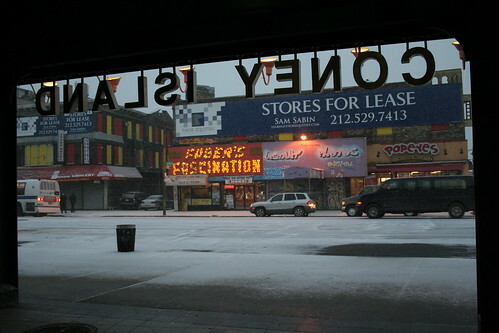 At the end of the 2010 season, longtime tenants Popeye’s Chicken, Fascination Arcade and Maritza’s Souvenirs were booted out and haven’t been heard from since. Thor’s proposed construction is a “ONE STORY NEW COMMERCIAL BUILDING WITH ASSEMBLY AND AMUSEMENT SPACES AS INDICATED ON PLANS FILED HEREWITH.” If you look under “plan examination” you’ll see that they have filed for a variety of types of permits (equipment, new building, general construction, foundation & earthworks, fencing) with a corresponding number of disapprovals for each. As shown under “all permits,” they have applied for and been issued permits for Foundations, Earthwork, and a Construction Fence in connection with the project. This will allow them to do the excavation and pour the foundations for the job, even while the New Building and other applications remain disapproved. When we first read about Thor’s plan and saw the rendering in Eliot Brown’s piece in the Observer–”The New Coney Island? Sitt Sees Fast Food in Place of Current Buildings”–we thought Thinkwell, a well-known firm in the themed entertainment industry, should be renamed Thinkworst for creating this crappy rendering for the gateway to Coney Island. 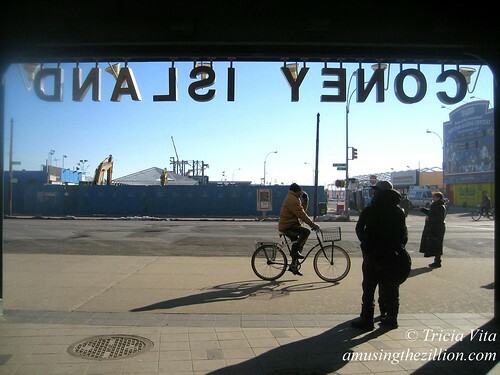 Thor’s plan to get demo permits from the City seemed calculated to put an end to Save Coney Island’s efforts to create an historic district in Coney Island. 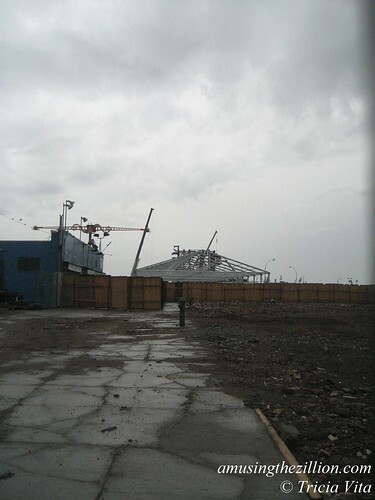 Last April, ATZ complained about “Thor’s Coney Island: Tattered Tents and Deathwatch for Historic Buildings” (ATZ, April 21, 2010). 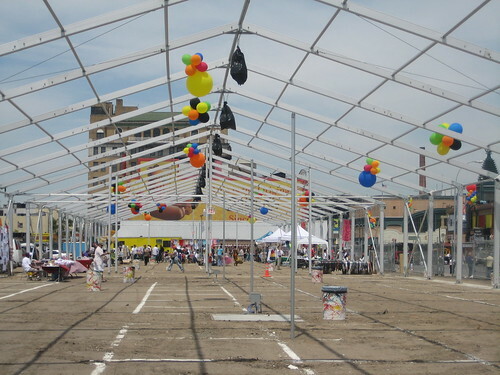 The bedraggled tenting was removed and the City put up fence wraps with colorful advertisements for Coney attractions to camouflage the empty lots. We’re curious to see what kind of bills if any will be posted on Thor’s blue construction fence. Posters for Aqueduct Flea by the Sea? Some readers have questioned whether Thor Equities ever really intended to build anything on the site. 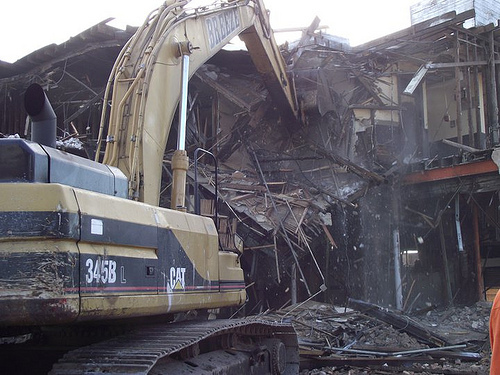 Were the building plans just an excuse to get a permit to demolish the Henderson? Why didn’t Thor’s architects resubmit a plan that would win DOB approval? Six months of disapprovals seems like an inordinately long time. ATZ asked someone in the building trade to take a look at the DOB page and give an opinion. Here it is: it IS strange that they had so many disapprovals for what seems like such a simple building, and i have to think that if they are proceeding with foundations, they either think they are about to get the new building application approved, or they are sensing some change in the regulatory environment and want to get the foundations in so that they can claim to be “vested”. who knows what that would be in this case, but does seem like a lot of trouble to go thru for a one story building (am sure they’re thinking the same thing). Coney Island photographer Eric Kowalsky, who documented the demolition of the Bank of Coney Island in November, has eloquently captured the destruction-in-progress of the historic Henderson Music Hall in this series of images. Eric put his camera through the gate on Henderson Walk to take the above photo of the crushed remains of part of the Henderson Building formerly occupied by Faber’s Fascination. “They took the front and side of the building down. 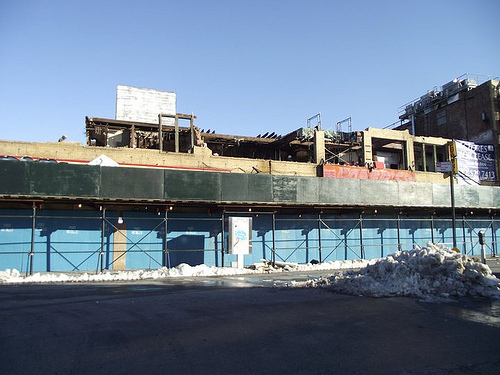 The Bowery is still standing,” he said this morning. Last week we posted historian Charles Denson’s video tribute to the Henderson Theater. As we previously noted, the City aided and abetted Joey “Bulldozer” Sitt by rezoning the Henderson parcel for a high rise hotel. There are however no immediate plans to build a hotel on the site. The City’s Landmarks Preservation Commission denied landmark designation and also declined to create a historic district, which would have created tax incentives to rehab the building. The Henderson Building is the first sight you see on Surf Avenue when you step out of Stillwell Terminal. It is at the corner of Surf and Stillwell Avenues. We should probably use the past tense, though the demolition is still underway. The first sight you see when you step out of Stillwell will soon be another empty lot to add to Joe Sitt’s collection of empty lots. Historian Charles Denson‘s video tribute to Coney Island’s historic Henderson Music Hall is beautifully done and, of course, heartbreaking. In addition to rare archival material, the video features an unexpected recent look inside the building, which is currently under demolition. 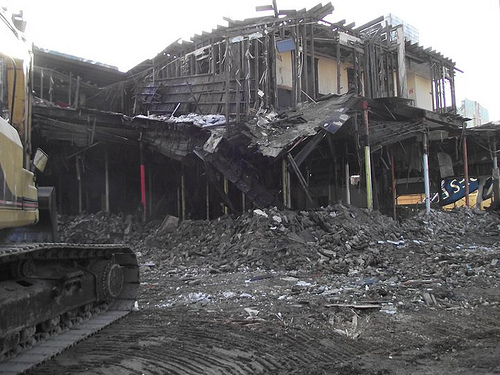 Last time we wrote about Thor’s demolitions, readers asked: Why wasn’t this building saved? The City aided and abetted Joey “Bulldozer” Sitt by rezoning the Henderson parcel for a high rise hotel. The City’s Landmarks Preservation Commission denied landmark designation and also declined to create a historic district, which would have created tax incentives to rehab the building.